Is there some number impossible to memorize? Do not worry, here comes mnemoneitoR: the tool that you was always looking for! 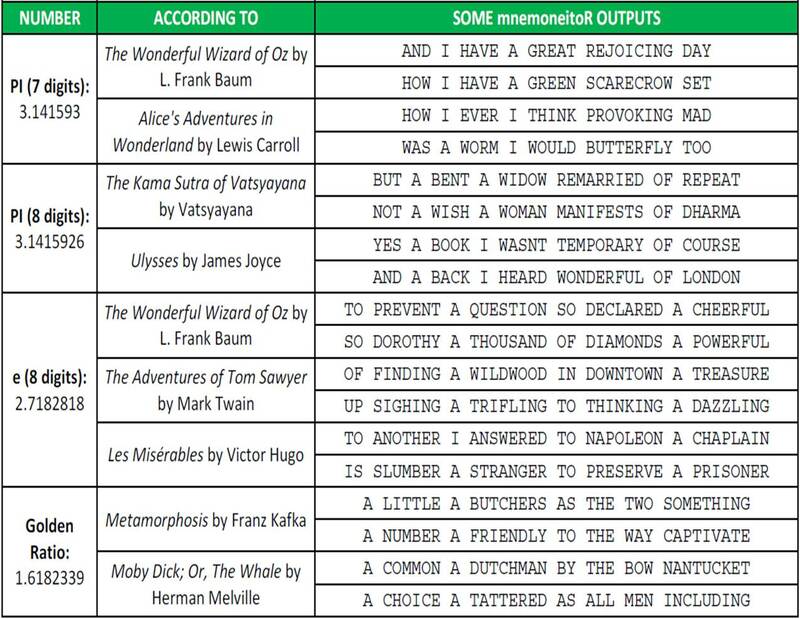 With mnemoneitoR you can translate any number into an easy-to-remember phrase inspired by your favorite book. It is very easy: choose a book, enter the number and mnemoneitoR will show you as many possibilities as you want. Just choose the one you like most! The number of letters in each word gives the respective number in the sequence (i.e., 3.14159265358979). Downloading the book is quite simple. You search the one you want, copy the url in the code (after line “CHOOSE YOUR FAVORITE BOOK HERE”) and no more. After loading the text, some easy tasks are needed: remove header and footer lines, split text into words, turn them into uppercase, remove non-text characters … typical things working with texts. After reading the number you want to translate, I choose a word sampling along all words with the same number of letters as the first digit with probability equal to the number of appearances. This is how I initialize the phrase. Next word are chose among the set of words which are preceded by the first one and have the same number of letters as the second digit with probability equal to number of appearances, and so on. This is a simulation on the fly of Markov Chain because I do not have to calculate the chain explicitly. I always translate Zero with the same word you choose. I like using “OZ” instead Zero. # ENTER YOUR NUMBER HERE!!!!! !